It was a busy time for my colleagues and I here at Soho Editors last month, but quite a telling one too. 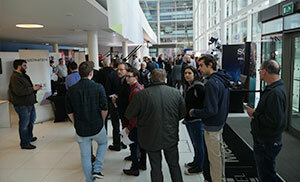 The relentless thrust northward of post-production, film, TV and broadcast services in the UK, saw us - and indeed many other companies - exhibiting at the Kitplus Tour, hosted at the MediaCityUK complex at Salford Quays. For all of our presentations at the show, it was standing room only, with many more than had pre-registered for the sessions tipping up on spec. This is quite remarkable when one considers it really isnt so long ago you would have been hard-pressed to find much interest at all in such an event outside the capital, let alone outside the W1 postcode. But not anymore; the Beebs move up to the North West has opened something of a floodgate. FCP X may be different, and has shaken things up for sure, but it was also readily apparent from the numbers attending our presentations that it is now being taken seriously by the industry and gaining traction with a lot of people. With this in mind, Soho Editors took its training expertise out on the road, showcasing how the latest incarnations of Final Cut Pro X, DaVinci Resolve, Motion 5, After Effects CC and Photoshop CC fare on the latest shiny Macs, whilst passing on a few tips and tricks into the bargain. Telling too, was the fact our presentations on Final Cut Pro X were so well attended. Those in the know are aware Apples convention-busting non-linear editor eschews a make it look like the cockpit of the space shuttle interface in favour of a cleaner GUI; a GUI more suited to the younger generation of people coming into the industry who have grown up with iTunes and iMovie. FCP X is unlike more traditional layer-based NLEs, but having regularly trained people on quite a few NLEs - including FCP X - it came as no surprise to me to see that when people actually give FCP X a whirl at our presentations - in concert with some decent training in how to use it to best advantage - they overcame their initial resistance to the changes it heralds and ended up liking the direction it takes. Not to be outdone of course, Adobe are making continuing efforts to see their own NLE - Premiere Pro CC - taken equally seriously by industry pros, but rather than offer presentations of two rival NLEs at the show, we chose to give Adobes After Effects a showcase instead. It was equally evident from the numbers who pre-registered with us for that presentation - hosted by yours truly - that After Effects remains a favourite with people and garnered a lot of interest, particularly since it now comes bundled with a chopped-down version of Cinema 4D, which expands its camera tracking possibilities considerably. Weve known for quite some time that 3D content is one of the new battlegrounds between rival post-production software developers, as evidenced by the 3D capabilities also grafted onto Final Cut Pro X. Its also interesting to note that Blackmagic are wading further into the post-production CGI software market with their new Fusion 8 offering; Apple are of course already in there with Motion 5, but one thing is for sure, the amount of choice we have for such post-production fun and games can only be a good thing as far as driving development of innovative software solutions is concerned. Like Apples FCP X, Blackmagics Fusion 8 shakes things up a bit where tradition is concerned too. As noted, when software breaks with conventions, it is understandable there will be some initial resistance, however, being stood at the back of Soho Editors presentation on Blackmagics Resolve - ably handled by my work college Rory Cantwell - it was apparent Resolves node-based GUI, whilst initially a little puzzling to people when they first see it, very soon begins to make a lot of sense. Interesting too that Blackmagic, like Soho Editors, is yet another company with a presence up north. They are taking a similarly node-based approach to the GUI of Fusion 8, in an attempt to rival After Effects CC and Motion 5, so it will be interesting to see which people end up favouring, if indeed we do end up favouring just one. Personally, I think it can only be a good thing to have more choices driving development and ideas; its certainly an exciting time to be at the heart of such things. Thus it was apparent from all these software goings-on at the Kitplus Tour, that whilst the BBCs move up north shook things up a bit in our industry, many other things are shaking it up too. But of course it wasnt all about software at the Kitplus show, truckloads of shiny equipment, from OB solutions to fancy lighting rigs and lenses were much in evidence, and again, the fact that companies were taking the trouble to put these on display outside of the capital - and receive a lot of interest for having done so - is more evidence that the North West of England is set to become something of a Klondike region for film and TV. Beyond what we at Soho Editors were doing at the Kitplus Show, the trek northwards for post production people has seen us continue to expand our database of post-production talent for the freelance agency side of our business, to complement the listings we have for people in and around the capital. Weve also reinforced the ability of people to gain the necessary skills for inclusion upon such lists with all kinds of incentives, guarantees and discounts to the training we offer, this being was another message we were striving to put over at the show. If you were at the show and were inspired to acquire some new skills, or even if you missed out on it, then you at least dont have to miss out on all of the cool stuff we at Soho Editors can offer if you take a look at our shiny new website at sohoeditors.com, and see what thats all about. Whilst you are at it, check out www.kitplus.com, where you can see a lot more about what was on show, plus insights into loads of really exciting things going on in the industry, which are really shaking it up. The next KitPlus Show is already in the planning stages for 8th November 2016 so save the date and expect updates over the coming months.